NPR interviewed Cheech & Chong this past Thursday. Update: Cannapalooza has been cancelled. "We regret to inform all of our fans who were eagerly anticipating the Cannapalooza event that Mandalay Bay has decided to cancel our contract for space and therefore we will not be able to hold the event. We are incredibly disappointed and appreciate the overwhelming support for the event that we have received since first announcing our plans." LAS VEGAS, NV--(Marketwire - January 27, 2010) - March Madness takes on a whole new meaning with the first ever Cannapalooza event, debuting March 19-21, 2010 at the Mandalay Bay Convention Center in Las Vegas. Cannapalooza, the international marketplace for all things cannabis, will showcase the latest products and technologies that have made cannabis one of the fastest growing industries in the world. Open to the public, Cannapalooza expects to draw 50,000 attendees from across the country and around the world. Now, more than ever cannabis is moving into the mainstream, with marijuana playing a key role in popular culture. Showtime's Weeds, pot infused musical lyrics and cover stories in national media outlets, along with heated political and medical debate have all pushed cannabis into the spotlight. The beauty and fashion industries have embraced the plant as well, with a rise in demand for natural hemp clothing and cosmetics. The event will span 50,000 square feet of convention center space and is designed to provide an entertaining forum where everyone from industry insiders and medical marijuana users to those with a casual interest can gather to celebrate the culture. Attendees will be surrounded by every imaginable product including hand blown glassware, industrial hemp goods and more. For three days Cannapalooza will be the largest head shop on the planet. Cannapalooza will also feature an educational symposium moderated by NORML's Russ Belville, with expert speakers and celebrity guests addressing legalization, decriminalization and medicinal benefits, while debunking marijuana myths and sharing simple home garden techniques, green agricultural technologies and more. Legalization and reform advocacy groups including The National Organization for the Reform of Marijuana Laws (NORML), Americans for Safe Access (ASA), Marijuana Policy Project (MPP), Law Enforcement Against Prohibition (LEAP), and Students for Sensible Drug Policy (SSDP) will be represented at Cannapalooza. Currently fourteen states, including Nevada, allow for the medical usage of marijuana and another fourteen are weighing legislation or ballot initiatives that would legalize medical marijuana in 2010. There are strong movements pushing for the outright legalization of cannabis across the United States, including California's Tax and Regulate initiative that will be on the 2010 ballot. To learn more about the event or reserve exhibitor space, visit www.cannapalooza.com. Here is video of Cheech & Chong on Lopez Tonight!. The opening bit with the creepy white girl was lame. The bit was written by show so don't blame Cheech or Tommy. The actual interview was decent. Many of the jokes you may have heard during their tour or from your grandpa's joke book. Cheech and Tommy stayed within their comfort zone by performing Mexicans Americans (which they perform at every show). They also performed a new song, Get It Legal, where Tommy basically repeats 'get it legal' over and over again. The Cheech & Chong: Get It Legal tour is coming to Edmonton, Alberta, Canada. Cheech and Chong stopped by the Bob and Tom Show. Cheech and Chong will be on George Lopez' "Lopez Tonight!" this Monday on TBS. They are doing the show because Cheech is friends with George and they are trying to sell more tickets for their Cheech and Chong: Get It Legal tour. The shows that went on sale last month haven't sold out. At last check, approximately half the tickets to each show have sold. They will also be promoting their new tour DVD Cheech and Chong's: Hey Watch This which will be released April 20th (420!). The "Lopez Tonight!" web site wants photos of fans that look like Cheech and Chong. From the WWE web site. The iconic comedy duo of Cheech & Chong are gonna like, take a break from their 2010 U.S. tour just long enough to score a couple of primo gigs on Raw. The stars of several films and Grammy winners for Best Comedy Album will float into Oklahoma City to take over the show. Trippy. Cheech and Chong will be special guest hosts on WWE RAW March 1st. Last night was the first show of the Cheech and Chong: Get It Legal tour. It took place at the Macky Auditorium in Boulder, Colorado. The tour is sponsored by MPP (Marijuana Policy Project). They paired up with MPP in part because Cheech and Tommy believe in the legalization of pot, but mostly because it allows for cross-marketing. In other words, the Cheech and Chong tour will get more press. More press equals more tickets sold. As promised, Cheech and Tommy did bits they hadn't done on stage before such as Dave's Not Here (a bit that was written with Dave from their old comedy troop in Canada; that's why it's "dave's not here" and not "tommy's not here"), Santa Claus and His Old Lady and Basketball Jones (which was written by Cheech while he and Tommy were in the backseat of Jack Nicholson's Rolls Royce). The Denver Post has a review with speaks of forgotten lyrics, lack of rehearsal, mic misplacement and "careless versions of the same material they’ve been listening to since the early ’70s." Cheech forgot the lyrics to Mexican Americans (a song which was performed at every show of the first leg of their tour). The comments on the Celebstoner blog concur. Big Cheech and Chong merchandise sale on ebay. Free shipping! TMZ: Who Would You Rather? Vote for Cheech or Chong here. Politico caught up with Cheech and Chong at this past weekend's Marijuana Policy Project Gala in DC. They said they most want to light up with Sarah Palin because she already seemed stoned the way she answered some of those questions. 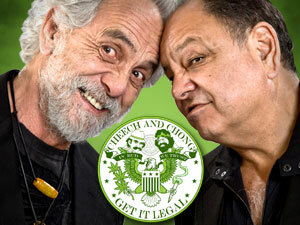 The Cheech and Chong: Get It Legal tour kicks off tomorrow in Boulder, CO. In related news, their animated film is 70% finished. Although the film web site has been down for months. Cheech and Chong received the trailblazer award last night at the Marijuana Policy Project Washington DC gala. While accepting the award, Tommy Chong reminded everyone that Canadian Marc Emery, who was convicted of selling seeds, is in jail awaiting extradition to the U.S. Tommy has been wearing a Marc Emery shirt for months to make people aware of the injustice. Last month, Tommy was seen purchasing pipes and whatnot from Marc's store. Cheech Marin and others turned out in support of America’s Most Wanted host John Walsh at a Bellagio dinner and golf tournament to benefit the National Center for Missing and Exploited Children in Las Vegas this past weekend. It's not always about the charity. Celebs mostly participate in these golf tournaments because sponsors give them lavish gifts. This can include huge gift bags with jewelry and electronics, as well as getting the privilege of driving the latest models of luxury cars. It doesn't matter how good you golf, you still get the gifts. Other celebrities included Alice Cooper, Davy Jones of The Monkees, Domenick Allen of Foreigner, Cheech Marin, Rudy Gatlin of The Gatlin Brothers, Kevin Sorbo, Bryan Cranston, Richard Burgi from Desperate Housewives, pro golfer Natalie Gulbis, astronaut Walt Cunningham, Mark Steines of Entertainment Tonight and Las Vegas headliners Angelica Bridges from Fantasy, Rick Faugno from Jersey Boys and Matt Goss. CBS interviewed Cheech Marin and Tommy Chong this morning. The duo is in town for tonight's Marijuana Policy Project Gala. They will be receiving the "Stoners of the Century" award . Wired.com reports from CES about Cheech and Chong Up in Smoke bluetooth headsets coming soon. On December 22 and 23, Tommy Chong brought his son Gilbran to "Marc Emery's Cannabis Culture Headquarters" to do some Christmas shopping. Tommy has been a strong supporter of Marc Emery and the Free Marc Emery movement.